We stayed at the John Fowler Ilfracombe Holiday park at the beginning of the school holidays in Easter 2011. There are three parks at Ilfracombe, but they are almost directly adjacent to each other and share the same facilities (including reception I believe). 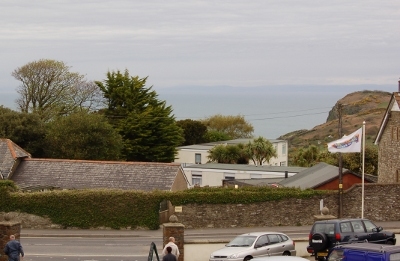 The sites are known as Ilfracombe Holiday Park, Golden Coast Holiday Park and Devon Coast Holiday Park. Accommodation is primarily in 3 story apartment buildings. We stayed in the Gold apartment which was in good condition, well maintained and clean. As well as the usual facilities there was a Dishwasher and DVD player. The TV was a bit on the small side, but then we didn't go on holiday to watch TV. There was a double room, and twin bedroom and sofa bed in the lounge (we did not need to use the sofa as a bed). The sofa was only sufficient for two people and the dining table and chairs for four. Our apartment was on the 1st floor, which was up some external steps. I'm not a fan of external stairs having seen some very poorly maintained ones at a different (not John Fowler) site, but these were in good condition. Access between the first floor and second floor accommodation was through internal stairs which go over the top of the double bedroom; unfortunately those in the apartment above us were very noisy in climbing the stairs late at night. There is a sheltered balcony across the front of the apartments which often had people smoking on them, but as a plus there was no smell of smoke in the accommodation. We had a sea view from our lounge, which I think was luck as it looks like only a few of the apartments would have view of the sea. There was a large car park for the accommodation, but it could have done with having some additional spaces. When we got back to the accommodation in the early evening we didn't find any problems parking, but those looking for spaces later had to resort to some creative parking to find a space. Despite the sea view, the park is situated some distance away from the sea and was best accessed by car. Nearby Ilfracombe has a harbour, an aquarium, shops and beach. There is a Tesco supermarket which is within reasonable walking distance. Situated on the North Devon coast there are lots of days out activities within driving distance. 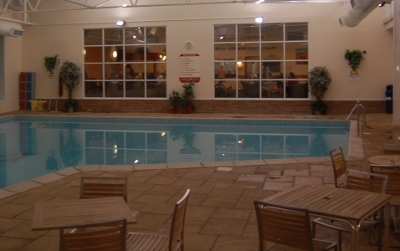 There are two indoor swimming pools, which are a reasonable size for the size of the park. The changing rooms were small, which was exacerbated as many people had left their clothes in the changing room. The lockers on the poolside appeared to be mainly broken or in use and we left our clothes in an unlocked locker. The smaller, shallower, pool was very busy, but the larger, deeper, pool (shown in the above photo) was not nearly so popular. The pool rules stated the no ball games or inflatables were permitted. Whilst this would not have been an issue in the larger pool, it's a shame that the rule about ball games was not enforced in the smaller pool as there was not sufficient space and there were small children in the pool. One of the main reasons for going to a John Fowler site was because of our previous experience of the children's evening entertainment at the John Fowler's at Widemouth Bay in Cornwall. I'm pleased to say that it pretty much met our expectations and the children enjoyed it. There was a chance for photos with one or two of the characters each night except for one night. 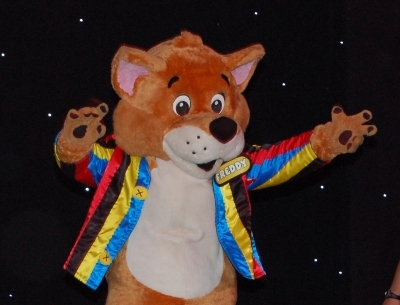 Then a visit from one of the characters later during the evening as part of a short routine or to dance along to some party songs. They played some party games which I don't think worked quite as well with some many children playing. For example with the musical statues most of the young children were out fairly early in the game and then had to watch lots of turns with the older children that were still in, although they did seam to let my 3 year old stay for a few games before he was out. I think they would have been better having more party songs. There was bingo between the two children's entertainment sessions (which included children's bingo). There was also some entertainment for the adults afterwards (eg. cabaret / magic), but with young children we took them off to bed so didn't see the entertainment after the final children's entertainment. The children's entertainment was good and is one of the reasons we will certainly consider John Fowler's for future holidays. Food was available in the entertainment venue to either eat-in or takeaway. This was served in an adjacent room to the main entertainment area. Food had to be collected, but they gave an approximate time for it to be available which was fairly accurate. Unfortunately I found the food we ordered to be a little disappointing (chicken wrap was very bland). Other facilities on the site include a shop, outdoor children's playground and small amusement arcade. I was very pleased with the holiday at John Fowler's Ilfracombe Holiday Park. Accommodation was good as was the children's entertainment. We'll certainly be thinking about John Fowler's in future, it's just a shame they only have sites in Devon, Cornwall and Somerset.